“Celebs-leather jackets” emerged a few years back and now it is among the ones who are moving the top of fashion and style. We make any kind of leather attire and replicate the Hollywood celebrity’s leather jackets, coats of any size and style. We are proudly presenting to our customers the famous legendary and King of Pop “Michael Jackson’s red leather jacket” which he donned in the video of his album “Thriller”. This red leather jacket is tailored carefully by our designers and premium stitching is being done thoroughly which shows the craftsmanship of our manufacturers. The high-quality leather is extracted from the healthy animals which make the jacket long lasting and durable. The inner polyester lining is made to comfy your body and protects it from the cold breezes. A short stand-up collar is made with YKK zipper closing on the front along with the buttoned closure. Diagonal black stripes are made on both the sides of front to give it a look exactly as the original one. Two waits pockets are given on the sides and sleeves are straight fit along with the smart stylish belted cuffs. 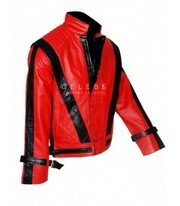 Car boot sale ad details Michael Jackson Thriller Red Leather Jacket for sale in London. Michael Jackson Thriller Red Leather Jacket available on car boot sale in London. More Other clothing accessories for sale in London and more second hand sale ads for free on 2lazy2boot - London car boot fairs - 40729.